What attracted me to Kyudo was the fact that, like many japanese arts, it is only an external excuse for an internal journey of spiritual self-development. 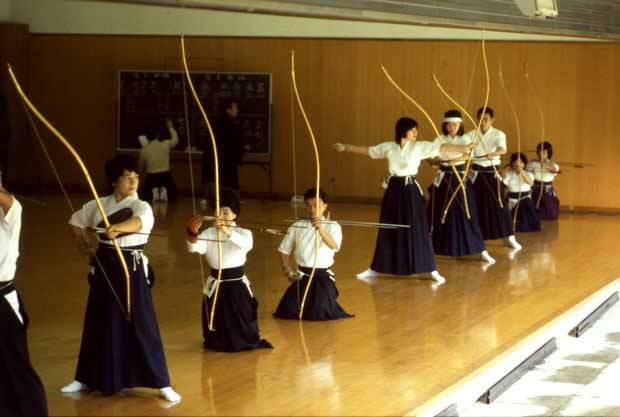 Although it derives from a martial art in which people were shooting their arrows to kill other people, Kyudo nowadays resembles more a target shooting practice. But this is where the similarities end. Right off the bat, the first big difference from "western" target shooting is that the aim is not to hit the target. In fact hitting the target is almost irrelevant. And if one is new to Japanese culture or to oriental philosophy this is like a wall - what? If I shoot at a target but it doesn't matter if I hit it, what's the point? Well, what would be the point to shooting at a target anyway? In the olden days it would have had a very clear finality - you would have killed your enemy. Or you could have gone hunting for a meal. But let's take target shooting with bows and arrows as a sport - the western sport - why do people do that? Some for the concentration it cultivates. Others for the competition. Others as a way to release accumulated feelings. The Japanese take this to a whole new level. Like they do with the Tea Ceremony - the goal is not to drink a cup of tea. The goal is to make it a meditation. When practicing Kyudo one is not aided by sights, scopes, stabilisers and what have you in western target archery, one is not focused on the arrow hitting the target. One is focused on cultivating the Spirit through the ritual of shooting. Yes - there is ritual. Again, nothing to do with religion. For the beginner, a series of postures and movements he has to learn by heart and accept them as such, many of them redundant at first sight if we were to consider shooting for the target centre. But as one advances one begins to understand their reason for existence - namely the link between these and the inside world of the shooter, the meditation that is Kyudo. The practice begins with the setting up of the Dojo - the room where Kyudo is practiced. When things are in their place, the senior conducting the practice assembles the students in front of the Kamiza - the place of honour. Then, students and master bow to each other and then to the Kamiza. The Kamiza holds a writing of the three principles of Kyudo: beauty, truth, goodness. To their development is the practice dedicated. Then practice begins. The ritual of shooting is slow. Posture is all important. Every move is slow, deliberate, yet natural. The slowness is for cultivating awareness for every detail, every move. Awareness - not to shoot more accurately, but for the purpose of cultivating it and bringing it into everyday life. The slowness contrasts with the rhythm of everyday hectic life, and the deeper one goes with Kyudo, the more one takes back into daily life the calmness, serenity, awareness and peace developed in Kyudo. There is no hurry. There is no objective to be checked. There is only the present moment. Every move performed with the utmost attention and presence, the spine erect, the movements stemming from the pelvis. The movements are encouraged to originate in the pelvis, as the energy is directed to the Dan Tian, one of the main energy centres of the body. Even when one shoots, one has to "shoot from the belly". All these details may seem unnecessary, but the very idea of Kyudo is that they are reflected in the shot and it is these details that make or break the harmony of the shot and the inner harmony of the shooter. The bow is raised maintaining the upright posture, and then descended in a movement that extends the bow and prepares for the shot. 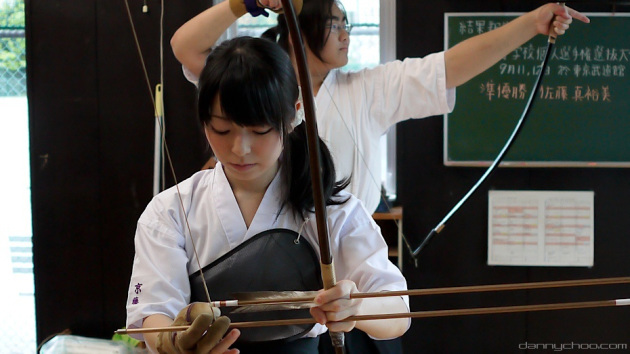 Next is the most important part of shooting: maintaining the bow in tension (Kai) and preparing for the release of the arrow (Hanare). 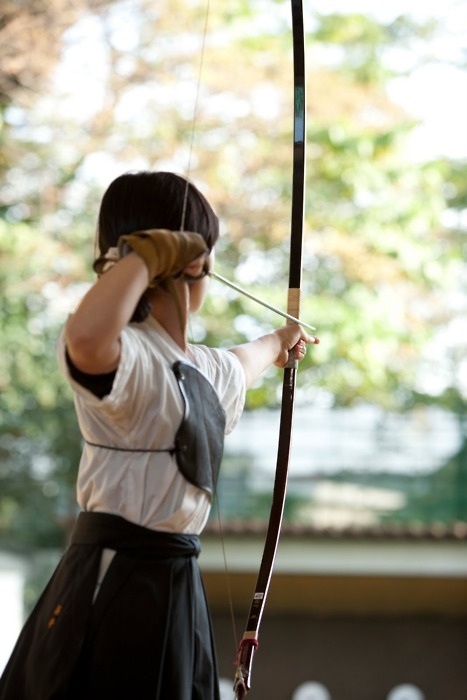 Cultivating the correct posture is difficult enough as it is, but maintaining its elegance and beauty while keeping a bow tense in the air is quite a challenge, considering that the right pull strength for the bow is chosen just beneath what one can physically pull. This I find to be the essence of Kyudo (and also typical of Japanese culture and history): cultivating the ability to maintain harmony, beauty and inner power even in the face of those things that push one to one's limits. It is easy to be serene in peaceful times. Mastery lies in maintaining that serenity and grace even in the middle of the storm. If we compare Kyudo to sitting meditation, there is a difference in that Kyudo makes the level of progress of the student very visible to the trained eye. There is no way to shoot correctly whilst not being harmonious on the inside. On the other hand, the development of correct shooting develops inner atributes. One can hit the target and not be harmonious, which is why hitting the target is not important. It is much better to shoot harmoniously and miss the target altogether, than to shoot ugly and hit the bull's eye. 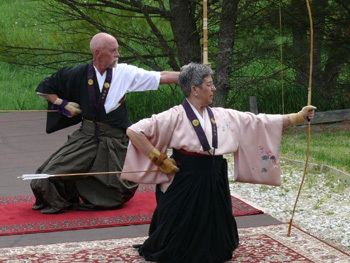 In fact practice begins by shooting at a straw target (makiwara) at two meters distance - it is almost impossible to miss, which moves the emphasis towards the shooting itself. In examinations at the basic levels students have to show that they can perform ritual shooting and going through all the phases of the shooting without missing any movements or adding unnecessary ones. Posture, attitude, harmony and inner strength as demonstrated in the shot become progressively more important at later stages. At the very highest levels of Kyudo the practitioners (already masters themselves at this level) are evaluated in their practice by other masters and criteria are here in the lines of: "the shot has to be transparent" or "truthful". At these levels the refinement is such that the emphasis is placed on the degree of inner perfection that the practitioner of Kyudo has achieved so far, and that is evaluated through the shooting. It is not uncommon for practitioners to fail an exam at this level for 10 or 15 years, but in the end, it is the perseverance and dedication towards self-perfectioning that counts. Adding another "dan" to one's level is merely the exterior recognition of the level of harmony and peace that already has become present in the life of a Kyudo practitioner.